Pastels are so great for summer. I love this outfit! Those colors are SO gorgeous! Can I please have that bag?! Your outfits are always so adorable! I’m loving the pastels mixes with the distressed denim. Gorgeous! Lovw, love, loving this look! Obsessed with pairing blue & pink. Funny, I just titled a post with similar hues “Cotton Candy” as well! 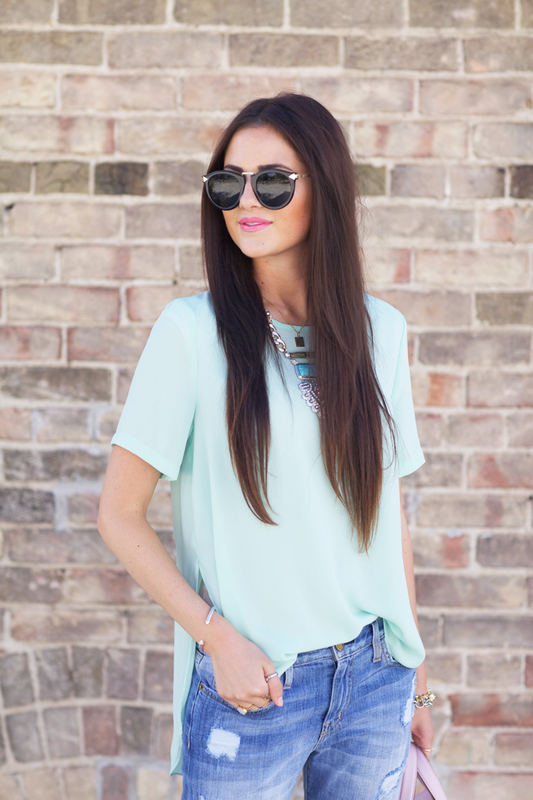 Love the mint + blush combo, that top looks so comfy! I work for Kate Spade and that is one of my most favorite bags I own! I got it from the Madison Avenue store. IN LOVE. Love the color combo! Fun, bright and perfect for summer! I’m so glad the pastels have not been forgotten about!! Love these 2 colors together. A very girly version of a relaxed look. This is such a cute look!! I love the pastel colors, so pretty! Need those heels. Loving the combination of the different blush colours in this outfit, really beautiful! Mint is such a pretty color on you! I really love this shoes!!! Great jeans, Current Elliott are my fav! So stunning. Love the pastels ! Omg so cute!! I love the top so much! Those heels are pretty pretty!!! LOVE the cut of them from every angle! Fabulous necklace and shoes! You look stunning!! This is my kind of perfect outfit! Those pastel colours are perfect and I love the juxtaposition of the feminine top and shoes and masculine jeans. Just gorge!! those heels and that bag! gorgeous combination. they must have been made for each other! and I love that shirt, as well. great look! I absolutely love this outfit- the boyfriend jeans and the shoes are so chic together. Plus that necklace is perfection. Love the colors! I love how you always mix the cutest colors together. I love this top!! SO in love with these blues! One of my favorite looks to date. I love the colors, very pretty. Those shoes are amazing! I love Kurt Geiger shoes. Great casual look. Love that bag.I have the clutch version and I’m in love!!!! Yes, yes, yes. A thousand times yes! This is such a cute look, love your mint top! Oh my gosh! This outfit is ah-mazing. I love the soft pastel color palette and those jeans! Super casual and super pretty! I love those heels and your hair is looking amazing! Definitely loving this color combo! So chic. The shoes and bag in my favourite colour. I love everything about this look! 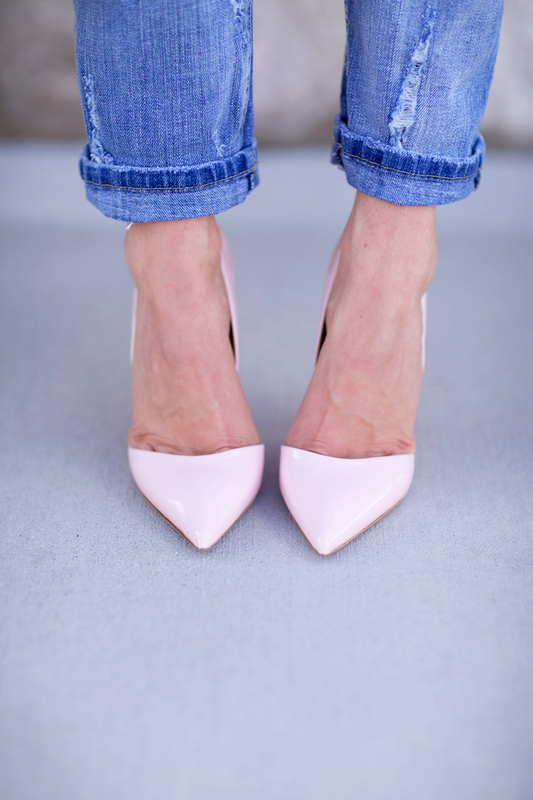 The pastel hues are perfect and I love the distressed boyfriend jeans with the heels! SO pretty! The pastels look gorgeous together. I’m crazy about those shoes!!! Super cute! I love your blush accessories. They really contrast with the boyfriend jeans. LOVE this look… so cute and summery! Love your pretty shoes and necklace! You look absolutely stunning! Obsessed with this outfit, it’s perfect! I love this blouse and the necklace with it! Beautiful look! I really like your necklace! Your matching bag and heels are super cute as well :) I have been loving the pictures of your sweet puppy on instagram! He is seriously so adorable. My hubby and I are waiting to get a dog, but it makes me want to get one now! I love, love, love this outfit!! You have been doing pastels so well lately!! Those shoes are to die for. I love the feminine details from the necklace, top, and purse! They pair so nicely with the destroyed boyfriend jeans! You look gorgeous!! I love these pastels together! The heels are a dream and are perfect with distressed denim! I’m loving these boyfirend jeans! They’re totally the first thing on my list of clothes to buy for when I’m not pregnant anymore! what a chic yet easygoing look! I love the colors in this look! I really love this look! The color combination is very interesting and definitely works. Pink bag and shoes are simply awesome. I am definitely adding this Kate Spade bag to my Wish List. Love these colors together! The necklace is the perfect accessory! Very beautiful! Beautiful blush & mint combination!! The bag and shoes are such a gorgeous & feminine hue. I have been wanting that statement necklace! Stunning on you! I love this whole outfit! Especially the shoes! Your hair is soooo pretty!! Totally wanting that beau bag now! Really cute outfit. How is the fit on those boyfriend jeans? I see you prefer Current jeans. Haven’t worn them in years. I am drooling over those shoes! That’s why I can’t have nice things…I”ll just drool on them. I adore that bag, is gorgeous and that shade of pink is so lovely. Gorgeous!! I literally love anything mint! You look amazing in a pair of boyfriend jeans, it’s so chic. I was so hesitant purchasing that baublebar necklace when I first saw it, It looked so pretty, but way too big on the model. But it looks incredible on you and adds the perfect touch to your outfit and seriously has me rethinking purchasing it. Love your use of pastels in this look! The cut of the shirt is fab! Just lovely, I think pastels will carry on from season to season. At first I was hesitant towards this since pastels are normally a Spring trend but now I really like the idea of incorporating pieces throughout each season’s wardrobe. School of Style Fashion EMERGENCY Kit Giveaway! The necklace reminds me of Child of Wild! Great look. Love the pastel mixing, blush tones and pale teal look gorgeous together! Your outfit is perfect! I love how the shades of pink are the same for your bag and shoes. I really like how you wear heels with jeans, it is a great mix! Your style is stunning and very inspirational. I love the fit of those jeans! Perfect boyfriend cut. So cute as usual. Just curious if you don’t mind, what size current/elliot jeans are you wearing? I’m always so lost when it comes to the sizing on boyfriend jeans. These are a 23. I went down two sizes! In a regular fit jean of Current Elliott I go down one size but in boyfriends I go down two. Love this outfit, especially the pink heels! So chic. Love the high low hem of your top! I love the pink Kurt Geiger heels and Kate Spade beau bag. So pretty! The mix of blue and pink is gorgeous! Love the top you’re wearing. Love all the pretty pink on you! You look great in pastels and love that you mixed the bold black sunnies with this outfit! I hope the boyfriend jeans fit trend NEVER DIES!! I love the shoes you chose to pair with. I love EVERYTHING about this look! The pastels are so perfect for summer and your shoes and accessories add the perfect flirty feminine touch! And those pumps are to die for. In love with those shoes and that bag! I just posted yesterday about how much I’m loving pastel pink at the moment! Love this look! You look like you’re comfortable but yet so put together. Such a sweet look! Love that bag! I love every single thing about this look from head to toe! It’s lady like but still casual… Perfect! the bag and shoes are sooo gorgeous! Looks so refreshing! Cold mint, sweet pastel pink and classic denim – great combination! Love the pastels on this look. Gorg!